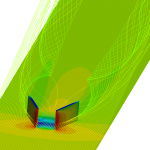 CENER’s simulation of vortex generators. A major, international €4 million research collaboration between 10 European partners is leading the development of seven novel offshore wind turbine blade technologies, which collectively could lower the levelised cost of energy (LCOE) of offshore wind by as much as 4.7%. The Offshore Demonstration Blade (ODB) project is supporting the research, development and demonstration of wind turbine blade innovations, including aerodynamic and structural enhancements, blade monitoring systems and blade erosion protection solutions. These products will be developed and retrofitted to the Offshore Renewable Energy (ORE) Catapult’s 7MW Levenmouth Demonstration Turbine in Scotland for demonstration purposes. The innovations will then be ready for deployment on existing or new offshore turbines. The two-year Demowind-funded project will be coordinated by the UK’s ORE Catapult Development Services Ltd (ODSL), and involve leading organisations in wind turbine innovation including CENER (National Renewable Energy centre of Spain), Bladena, TNO, Aerox, Siemens Gamesa Renewable Energy, Total Wind, Dansk IngeniørService A/S (DIS), the Technical University of Denmark (DTU) and the Cardenal Herrera University (CEU) in Spain. Operations and maintenance costs represent almost a quarter of the total LCOE of an offshore wind turbine, with rotor operations and maintenance, specifically blade erosion and blade structural integrity, representing a large share of these costs. Therefore, improving the performance and operational lifetime of turbine blades will have a direct impact in lowering LCOE. CENER´s role in the ODB project is to design a low drag vortex generator with the aim of reducing flow separation in the blades without adding a drag penalty to the blade. Wind turbine blades size has scaled-up during last years due to wind turbine platform increase especially for offshore applications. The interest of wind turbine manufacturers in blade add-ons has risen to mitigate flow separation and blade loading. One type of add-ons is the vortex generators. Vortex generators are designed to create vorticity on the blade surface to mix high momentum zones in the upper part of the boundary layer with low momentum zones near the surface resulting in a velocity profile less prone to separation. CENER has more than 15 years of experience in the design and calculation of wind turbine blades, airfoils and add-ons as well as in performing CFD calculations. 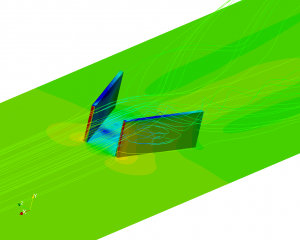 In the figure, a fully resolved CFD simulation of a rectangular pair of vortex generators is shown.